If you love nothing more than soaking up the sunny outdoors and dining al fresco, you’re unlikely to find a better choice of quality wood-fired oven than this beautiful Portuguese model from Escape the Outdoors. This robust pizza oven has sold to customers all over the world who are looking for that authentic stonebaked Italian experience. Not only does this oven produce genuinely mouthwatering pizza, it can also bake a multitude of other foods to perfection, including bread, meat and fish. Where a traditional brick oven can weigh in excess of 500kg, this wood-fired outdoor pizza oven weighs just 55kg, making it considerably easier to move and install. The oven is well insulated, with a firebrick cooking floor under a ceramic cover, and an aluminium skin that is available in black or red. It also comes with a free baking dish, pizza peel and fire retention guard, which saves you from buying them separately. One of the lovely things about this outdoor pizza oven is just how easy it is to use. It’s as simple as lighting a fire and waiting for it to heat up. Once lit, it takes just half an hour to reach optimum cooking temperature (between 350-400°C) – at which point you will be able to cook hot and crispy stonebaked pizzas (and more) within minutes. This oven measures 70 x 98 x 70 cm, with an internal cooking space of 60 x 60 cm. The opening is 37 x 22 cm. It has a stainless steel baffle, designed to direct hot smoke and extract more heat, and a 140 mm flue. The temperature is easily regulated using the air vents in the door and the flue. 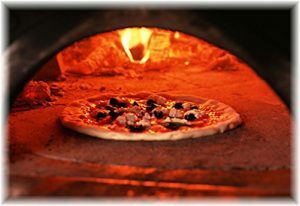 Crafted from high quality refractory cement, stainless steel and aluminium, this robust wood-fired oven is fully protected from cracking – which can be a real problem for traditional brick pizza ovens. 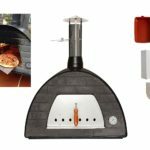 While this is one of the more expensive wood burning pizza ovens we have reviewed, in our opinion, you really get what you pay for. This gorgeous bread & pizza oven comes fully assembled straight to your door (with a manufacturer’s warranty) and is delivered throughout the UK – except for Islands and Highlands. Quick, effective and easy to clean, this is an exceptional outdoor wood burning oven for true connoisseurs of rustic Italian cuisine.